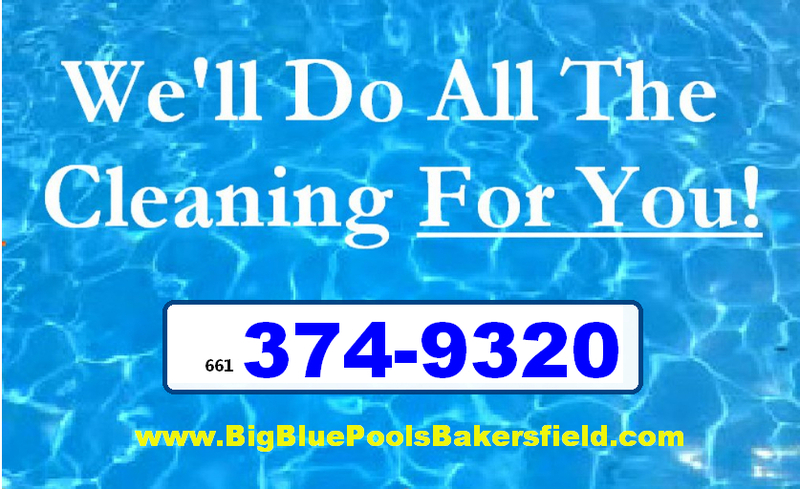 Bakersfield's Best Pool Service - Big Blue Pool Service - Best in Bakersfield!Big Blue Pool Service – Best in Bakersfield! When you are looking to put in a new pump motor, who do you trust? How do you determine which size of motor to install? Which pool motors are designed to be cost effective? Did you know that it’s not uncommon for some pool companies to put in a smaller motor than you need when you have a home warranty? Why? Because that motor costs THEM less money to purchase and install and the insurance company will only pay a determined amount – therefore it is better to maximize their own profits by installing a pump that is cheaper in quality and smaller than your pool actually needs. This of course will create flow issues as well as simply not clean your pool effectively or save you the money that the correct pool motor can do. 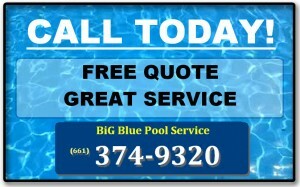 While it may seem self serving, it is VERY true that NOT all pool service companies are equal. Frankly, some “pool guys” have no experience, while others are simply disreputable. They may even have the biggest yellow pages ads, but beware and be careful to pick a pool service company that you can genuinely trust. Number of years in business under the same name and ownership. Who is the owner? What;s their reputation in the community? Do they perform background checks for the pool techs who will come to your home? We ask that you give us -Big Blue Pool Service an opportunity to prove why we are a trustworthy pool service, one that will do for your pool what it needs because we have the pool service and engineering training to know exactly how to do it. Swimming pool pump motors are the life of your swimming pool. If the motor on your pool pump fails everything halts. There is not any water circulation, chemicals are not being spread, the pool is not being cleaned, and any accessories or water features you have cannot be utilized. Below we will discuss how to diagnose pool pump motors and prevent costly pool repairs. Usually when your swimming pool motor fails the motor will hum. If your pool pump is humming then one of the following problems have occurred 1) the pump impeller has an blockage 2) the motor capacitor has failed 3) the motor bearings are frozen solid holding the motor shaft 4) there is a bad motor start winding. Problem one: the pump impeller has an obstruction. First, turn the power off to the pool equipment. Second, take the pump housing apart by removing the housing bolts or housing clamp. Third, remove the pumps impeller diffuser by pulling the diffuser loose or unbolting it’s fasteners. Now when removing the impeller diffuser the obstruction should fallen out or be visible. If no obstruction was noticed then spin the pump impeller by hand. The impeller should spin freely without a grinding noise and should not wobble. If the impeller wobbles then it could be warped from heat or the impeller has failed. If necessary replace the impeller, diffuser, and shaft seal. Problem two: the pump motor capacitor has failed. The easiest way to check this is to turn off the pool equipment’s power and remove the capacitor from the motor while being careful not to cross the posts on the capacitor or touch the posts to anything including yourself. Capacitors store power so when the motor is switched it sends that boost of power to turn the motor shaft. Now with the capacitor removed from the motor you can discharge the capacitor with a screwdriver by crossing the two posts on the capacitor. Warning: if the capacitor discharges it is very violent spark. Often times it will ruin the screwdriver. So make sure to use a bd screwdriver with an insulated cover and wear eye protection. Now that the capacitor is discharged you can match a new capacitor to it and install the new capacitor with the equipment’s power off. Replace the cover for the capacitor and turn on the pool equipment’s power. If the motor begins running normally then you have successfully replaced the motor capacitor. Problem three: the pump motor bearings have frozen solid and is holding the motor shaft still. A grinding noise is also present when the motor bearings have failed. At this point you will need the pool pump motor replaced. Some pool companies can reconstruct pool pump motors. The best way is getting a new pool pump motor from the Internet. You can get a new motor with a full warranty (1 year) at a great price. Problem four: the pool pump motor has bad start windings. When this problem occurs the three prior problems have checked out. Sometimes even though the impeller and diffuser have checked out they can stil be warped when assembled. Double check this step. If this still checks out then replace your pool pump motor. You should know how to replace or repair your pool pump motor with confidence. Whenever there is doubt don’t be afraid to call a pool technician to come diagnose your pump motor. I wish you much success in your business. I say that because I’ve grateful for what you have done with my pool and your hard work in doing so. Your effort is appreciated.